When Radlett Reform Synagogue‘s senior rabbi, Paul Freedman, wanted to co-lead a service with their cantor-to-be, Sarah Grabiner the fact that she was in New York, finishing her studies at Hebrew Union College was no deterrent. 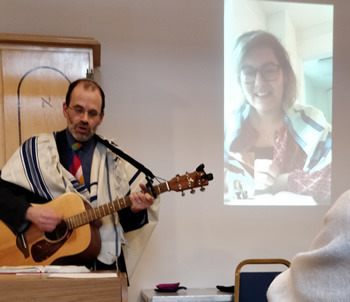 Known for his creative thinking, the alternative Shabbat morning service was led in Radlett by Rabbi Paul with Student Cantor Sarah leading prayers and leyning (chanting from the Torah) using Facetime from America. As New York is 5 hours behind Radlett, the service was themed “Morning has broken” and included the Talmudic discussion around what is the earliest time one can say the morning Shema prayer, as well as concluding with the Adon Olam to the tune of that name. This was the latest in a series of alternative services at Radlett Reform, others have included using alternative prayer books from other movements, a walking service, meditation and looking at the shacharit prayers through film. Student Cantor Sarah who will be ordained in May this year will join Radlett as their third member of clergy at the beginning of July. Rabbi Paul commenting on the successful series said: “we want to offer our members rich and meaningful experiences with opportunities to explore what prayer really means to them, these alternatives provide that opportunity alongside our regular services and are well attended”.